The Data Connect IG192HFP Industrial Grade 19.2kbps Hyper Fast Poll industrial modem is the highest performance triple mode, full featured leased line modem of its class. These modems are designed for rugged industrial automation, utility, and SCADA communications. Boasting the latest innovative digital signal processing (DSP) technology, the IG192HFP modem delivers a 17.4 ms training time (RTS-CTS delay) at 19200bps. The modem will fall back to support 9600/4800/2400 bps at 23 ms RTSCTS delay, as well as Bell 202T and V.23 operation. The IG192HFP is ideal for point-to-point and multi-point polling network with the industry’s fastest training time.The IG192HFP Industrial Grade 19.2 kbps Hyper Fast Poll modem is designed to operate over 4-wire full duplex or 2-wire half duplex unconditioned leased lines or private metallic circuits. For optimum performance, the modem employs QAM modulations and Viterbi decoding scheme along with its adaptive equalizer to communicate over a variety of transmission lines. The IG192HFP supports DTE/RTUs with an EIA RS-232 and RS-485 serial port at speeds of 19200, 9600, 4800, 2400, and 1200 bps. 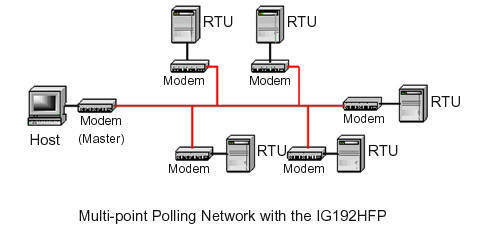 With its Auto-RTS mode, the modem can support DTE/RTUs with 3-wire serial interface (TD, RD, SG) in point-to-point and multi-point polling applications.The triple mode capability allows the IG192HFP Industrial Grade 19.2 kbps Hyper Fast Poll modem to communicate with the older generation DSP9612FP at up to 9600 kbps and both the Bell 202T and V.23 FSK modems at up to 1200 bps. The IG192HFP Industrial Grade 19.2 kbps Hyper Fast Poll modem is designed to operate over a wide range of AC or DC power supply voltages and temperatures. With proven reliability and ease of installation, the IG192HFP is ideal for point-to-multipoint polling networks, where fast training time and low network latency are critical for system performance.